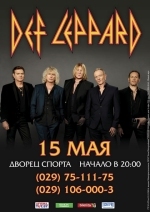 Def Leppard will play in Belarus for the first time in May 2015 it was announced by the local press earlier today. The band will play the 4,500 capacity Sports Palace on 15th May in Minsk during their 2015 European Tour. This will be their first visit to the former Soviet country having visited Russia in 2003 and 2008 for three shows. 12 shows have now been announced for the 2015 European tour. 25 shows have now been announced in all for the 2015 world tour. "As BelTA learned from the concert agency "Atom Interteyment" schedule tour DEF LEPPARD not forget to include and Belarus. Rockers visit Belarus for the first time. Their performance will take place on the stage of the Palace of Sports on May 15. At a concert in Minsk DEF LEPPARD perform their best songs in the history of the group. Audiences can expect a great show, and perhaps surprises from British musicians."